Last year I did a post of my resolutions for 2012. I don't think I'll do that this year. Things seem different. This time last year I was about to start a beautiful month of holidays including 10 days in Tasmania which were wonderful. This year I'm going back to work on Wednesday. Last year I was excited about a new role at work and had lots of plans and ideas to implement. This year I also have a new role at work but I'm more apprehensive given the year that has just been. I'm trying not to think about workload calculations, program rules and regulations, QA manuals, duty statements, timetabling, metropolitan campuses, meetings, agendas, minutes, dealing with "challenging" people, sessional staff, contracts and other such things. Clearly, I'm not doing a very good job. I'm also trying not to think about how I am going to fit my piano teaching in this year, together with choir, orchestra and study. The week does not seem big enough. Of course it will all fall into place as it always does but right now I'd love to be starting a long holiday, focusing on getting some exercise and eating right, cultivating some more hobbies and achieving some balance. No doubt I will think about this some more not just today but over the coming weeks and months. I took myself to the movies this morning to see Les Miserables. I am always a bit concerned about going to see films of which I have heard good reviews. Inevitably, I am disappointed. Perhaps my standards are too high? Whatever. This post isn't about me. It's about Russell Crowe. First though let's talk about the good things. Anne Hathaway has finally delivered a film performance I can praise because let's face it The Devil Wears Prada was too long, very boring and extremely superficial and the less said about The Princess Diaries the better. Her singing was impressive as Fantine and she did the part justice. Of course Hugh Jackman was outstanding as Valjean. Did we expect anything less? If you have seen him in Oklahoma (which let's face it you may not have) you would know the man can sing. Here he is perfect in every way. Amanda Seyfried is fine as Cosette, the most boring part perhaps but she manages to convey some substance. Eddie Redmayne (?) is excellent as Marius. I was genuinely moved by Empty Chairs and Empty Tables. This chap can sing and act. Helena Bonham Carter and Sacha Baron Cohen are fine comic relief as the Thenardiers. I expected a little more from them. At points I felt like they may have been phoning it in, but they got away with it as the comic foils all the same. The sets and costume were fabulous. The new song, Suddenly fitted seamlessly into the score. Unfortunately though Russell Crowe is dreadful miscast. That is, Crowe can sing but with the high standard surrounding him he fails to bring any sense of power to Javert and that is what is needed. Everyone else tromps all over him and (spoilers) when he falls into the Seine at the end all I thought was "meh" where it should have been a major moment in the plot. Also, he totally failed to do justice to Stars - one of the treasures in the many wonderful songs in Les Mis. This is what it should sound like: I imagine there are a lot of excellent theatre actors who are currently despairing at Crowe's casting. It leaves a big hole in what otherwise is a great movie version of Les Miserables. I like it a lot! 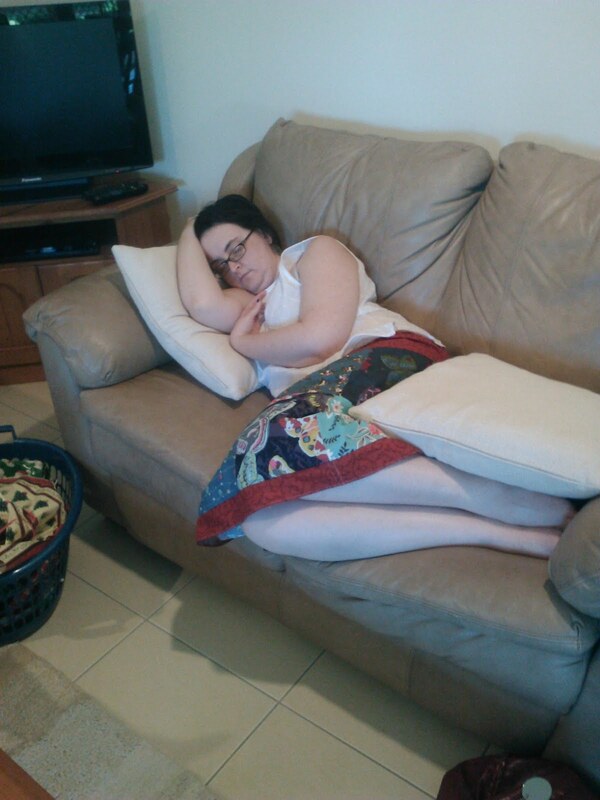 Then I fell asleep on my parents' lounge. My Dad has developed a slightly annoying new habit of taking photos on his smartphone of people while they are asleep. I did wonder why he asked me if I had checked my email a while after I woke up. He's a trick! Keen readers will notice I am wearing my patchwork skirt. It wore beautifully and hardly creased at all. I lurve it. Sadly, there wasn't any sewing today. I am running out of days before I have to go back to work. I had every good intention to do work from today onwards. I have an ethics application to put together, a research project to start properly, some QA manual to keep writing and other delightful things. I had even made a bargain with myself that I would have "holidays" up until Boxing Day and then after that would devote part of each day to work tasks. But now that today has dawned I have no desire to spend any of it working. I just want a holiday. I need a holiday. The weeks (and dare I say months) leading up to Xmas were hectic and mentally draining at work. And when I return on January 2 I know I am going to be busy and challenged in a new role. So, although I will feel a little bit guilty, I have changed my mind on the working front today. I'm not going to do a thing. I will sew and read and maybe go shopping. I will plan to go to the movies. I may drink tea and stare out the window. It might look like I'm not achieving anything but in fact I will be relaxing. My brain - she is tired. She shall rest. Then I ate lunch and slept for a solid two hours. It was fabulous and I woke up feeling much better. I even made a cup of coffee. 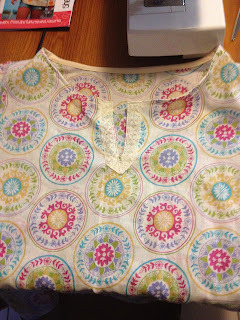 And then I sewed some more. This is one of my standard tops that I had cut out last week. 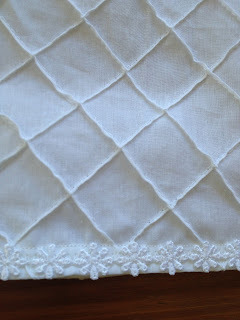 This was the third time I had tried the pattern and I have just about got it sorted out now. I went for a walk in the late afternoon with my Mum. It was a bit hot still but not too bad. Now I just have to watch Doctor Who and that's Boxing Day. Tomorrow may be movies, sewing, reading, sleeping or some combination of these activities. Christmas is done and dusted for another year. I got lots of lovely green gifts including a complete set of bathroom towels etc, a cute green purse, a green spotty mug, some green tea and new cushions for my lounge. 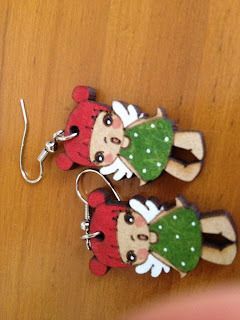 Non green gifts included a scratchie ( I did not win anything), pins and a pincushion and these fabulous earrings. Those of you who are aware of my penchant for silver filigree jewellery will understand my joy at receiving these from my grandmother. What she didn't know is that I chose and bought them myself and then gave them to my mother to give to her to give to me. My Dad was totally convinced by my delight at unwrapping the gift. I didn't win that Year 12 Theatre prize for nothing. We ate, we drank, we were relatively merry and then we all ran out of puff by about three o'clock. From then on it was napping. I got a headache so took some panadol and had a lie on the bed in the aircon. After my parents took my grandmother home we rallied a little, ate some leftovers (cold lamb and roast potatoes!) and then I further inducted my mother into the ways of the new iPad. I left her sitting in the lounge with a look of glee as she made her way through the levels of Angry Birds. I should probably say something profound here about the meaning of Christmas and suchlike but I'm a little bit tired. I'll let John Lennon say it for me. And here we are at Christmas Eve. In an effort to have a Christmas event without my grandmother, for the last few years I have my parents and sister for dinner on Christmas Eve. It's not a big foodie event. It's just a moment before tomorrow when we can have some family time. Soon I will make some salads and a trifle. I will also have to clear the dining table of all sewing paraphernalia but that can wait until much later. For our entertainment I think I will find some Xmas episodes of TV shows for us to watch. Yep, forget the carolling around the piano. We're a TV watching family from way back. Traditions! I checked through last year's Christmas Countdown and it seems I restrained myself and did not include my favourite ever Christmas song. Apologies if you saw my tweet from a few nights ago. I make no excuses for loving this song. That's correct. I am unashamed and for once, not being ironic. If that's too much for you enjoy my number one choice from last year. Such Fun! I adore Rockwiz Christmas Specials. Merry Christmas! 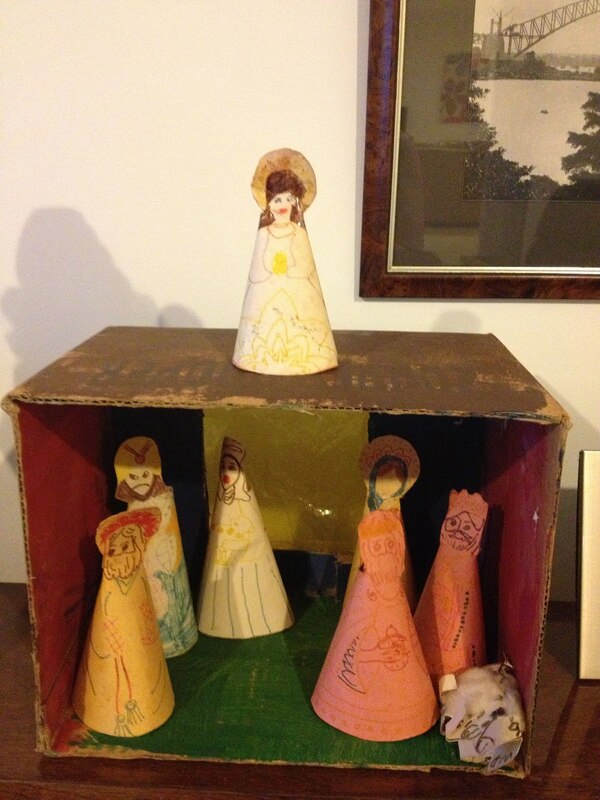 Inspired by @georgianoakes twit pic of her childhood handmade nativity scene I present to you this. Behold its wonder for it is a nativity scene made some 33 years ago when I was in Year 2 at West Bundaberg State School. It has been the pride and joy of the Davis family Christmas decorations for every year since. (Excepting the years when my brother refused to let my mother get it out the cupboard because it was too crappy). I can still remember the joy of making it. I was especially attentive to making the angel's hair a beautiful brown with my felt pens. She also got the glitter (now much faded) on her gown. I still have trouble telling the difference between the three wise men, Joseph and the shepherd so you are excused if you have the same problem. The sheep is covered in real 1980s cotton wool and held on with Clag glue. And you will notice at the back of the manger (ice block box from the tuckshop) there is a "window" of cellophane. I think you're supposed to shine a torch back there to provide some light. So put away your fancy schmancy Christmas decorations and enjoy the delights of children's craft from days of yore (yore being 1980). What's Christmas Countdown without a little bit of Festivus. Classic. Every year I swear that I will not be caught up in Christmas fashions. But what did we see yesterday dear readers? That's correct. 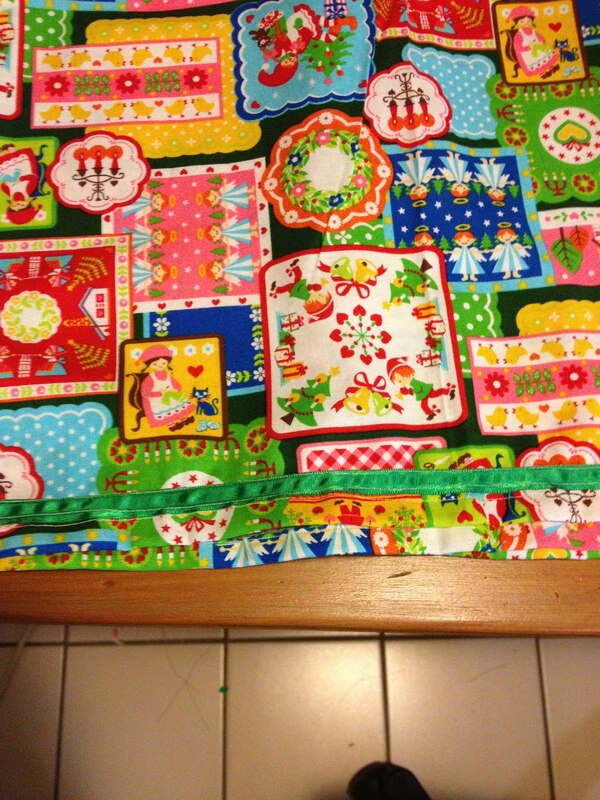 A CHRISTMAS SKIRT. Where does it end? Here. 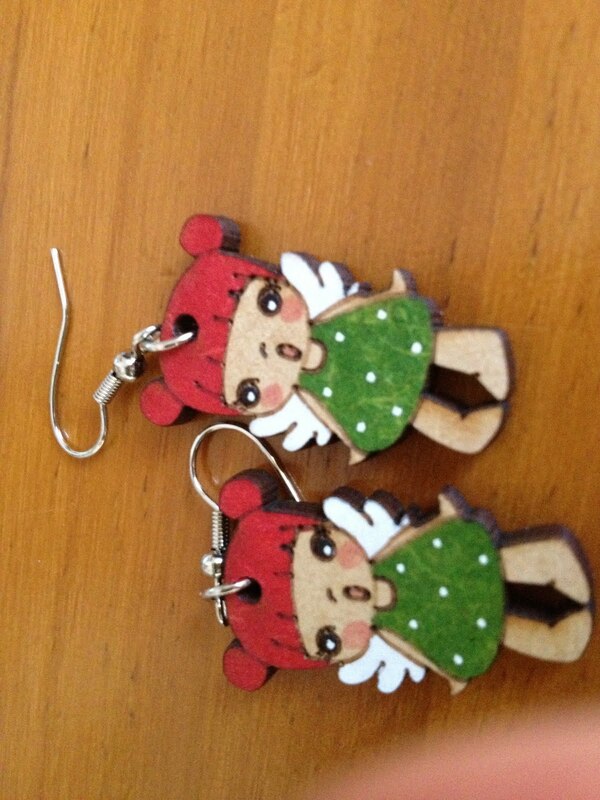 With these Christmas earrings that I bought yesterday. I'm sure they're quite tacky but I bought them anyway and I will most likely wear them every day from now until Christmas. Damn it I'm wearing them as I write this post. 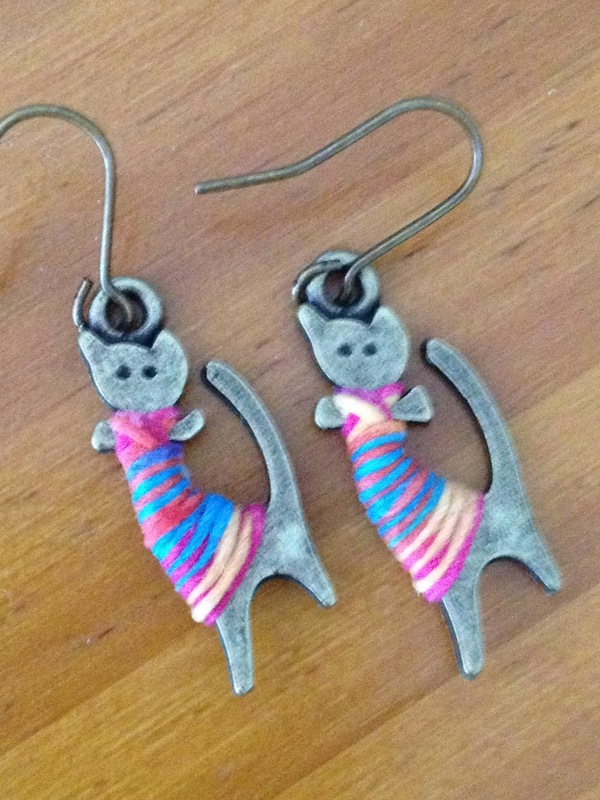 Because if you can't wear festive jewellery in late December then when can you wear it? 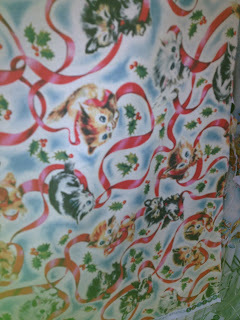 I impulse bought this piece of Christmas fabric a month or so ago in an internet buying frenzy. I didn't really have a plan. 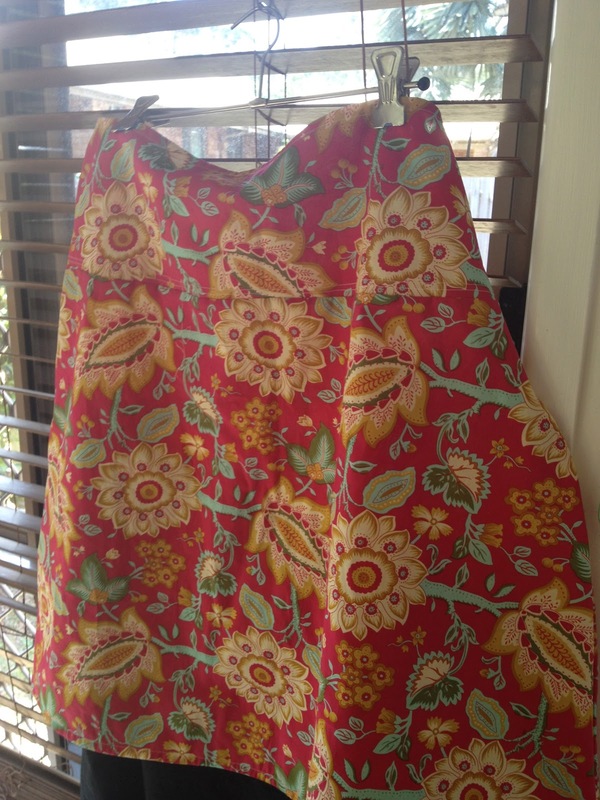 First I thought about a blouse, then perhaps bunting, a tablecloth ....and then this afternoon I decided to throw caution to the wind and whip up my very easy skirt pattern (which I have got down to an hour) so I would have a Christmas skirt. Of course I can only wear it this week and on Christmas day. That's okay. I didn't want the material to sit in the cupboard unused until next year. I missed posting yesterday so here are two of my favourite traditional carols. Last night was the final choir concert for the year at the Holy Rosary Church with the Bundaberg Municipal Band. This is what is an important part of my life here in Bundaberg: community music. And while sometimes I may complain about having to go out every Monday evening to choir rehearsal, ultimately, I do it because I believe in the power of music to bring people together; the power of music to provide individuals with a place, a voice, a sense of purpose; the power of music to generate a sense of belonging in a community. The majority of people involved are not professional musicians - a few are. That does not mean we do not strive for a high standard. We do. Sometimes though we do it with only two tenors, or sopranos missing in action. We soldier on. Seriously, though I think the real reason we do it is for events like our concert last night. This is a time where we can be involved in the community, where we make a connection and use music to engage with others. And let's face it: quite simply, singing makes you feel great! This is one of my favourite Christmas songs and here is a great version. Enjoy. 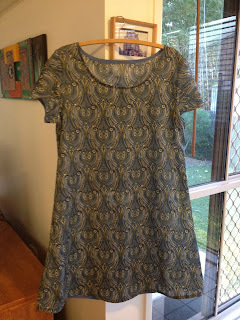 I was excited to receive a dress pattern in the post this week and couldn't wait to try it. Luckily I took the advice of the pattern and used a material I was not in love with for the first attempt. 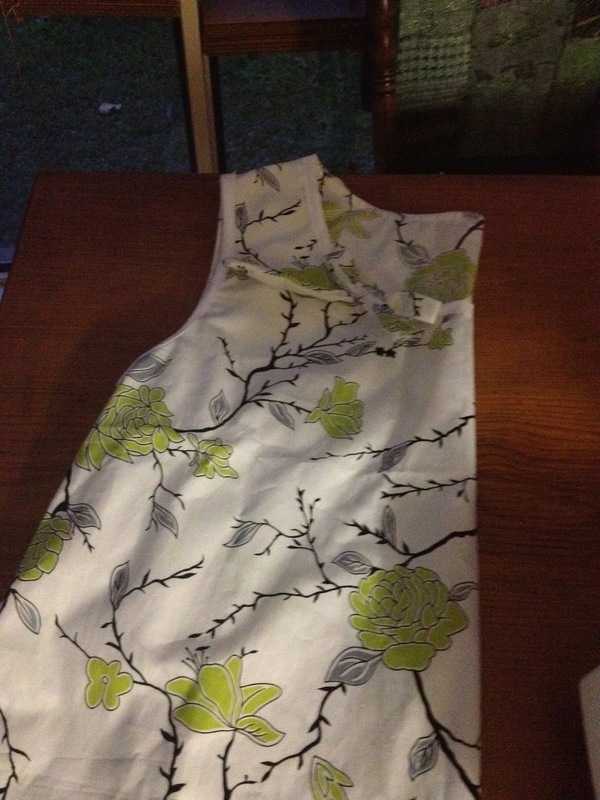 The dress has a fitted bodice, waistband insert and then gathered skirt. I managed to fit the bodice quite well. I inserted the waistband pieces successfully and managed to work out how to insert the invisible zip at the back. 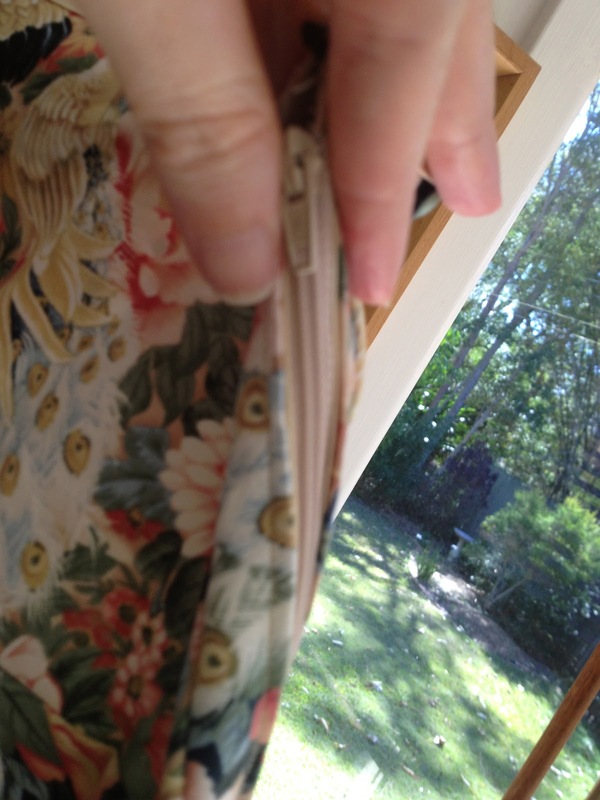 There are some issues with the waistband aligning all the way around (oops!) and I think I cut the skirt pieces one size too big as they are very gathery. Also the material is a bit heavy so doesn't sit very well but I needed to use it for something and I will know what to do next time now. 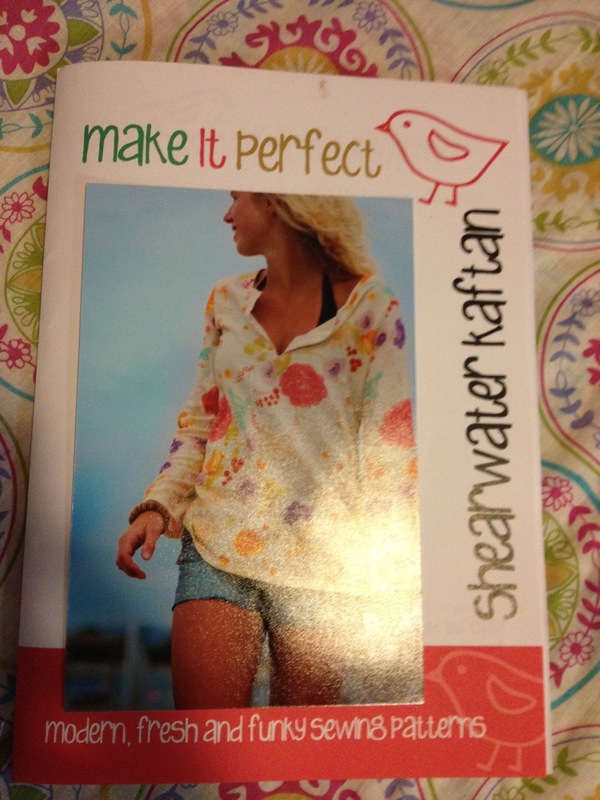 It's definitely wearable but not a super awesome success. 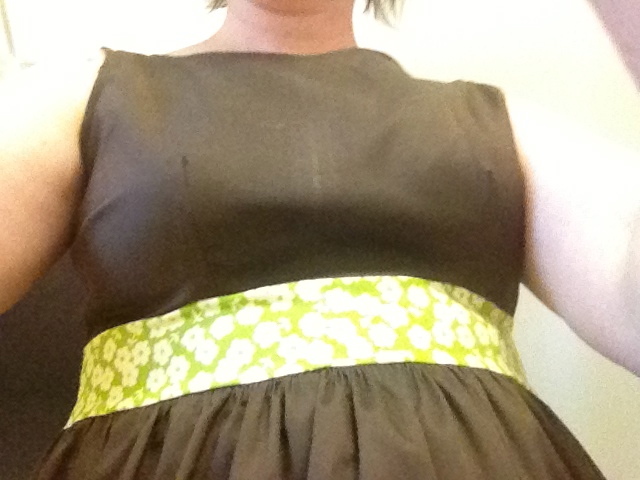 I was happy with my choice of a contrasting waistband and matching hem though. Pretty patterns. I suppose this was inevitable. I am inspired to drag my paltry single string of fairy lights out of the cupboard and plug them in. Well this is the kind of nice surprise that youtube can provide. I love Steve Martin. Here's another one I prepared on Sunday: In the Bleak Midwinter. I was mucking around with some double stopping. My rusty violin fingers certainly were surprised as you may hear! Here's me playing one of my favourite Christmas carols: O Come O Come Emmanuel. I don't know what came over me the second time through when I went up an octave but apologies in advance for slightly dodgy intonation. Here's me playing the piano in the new room for the first time. I chose this simple carol: Bring a torch, Jeannette Isabella. Sorry about the light. No curtains. 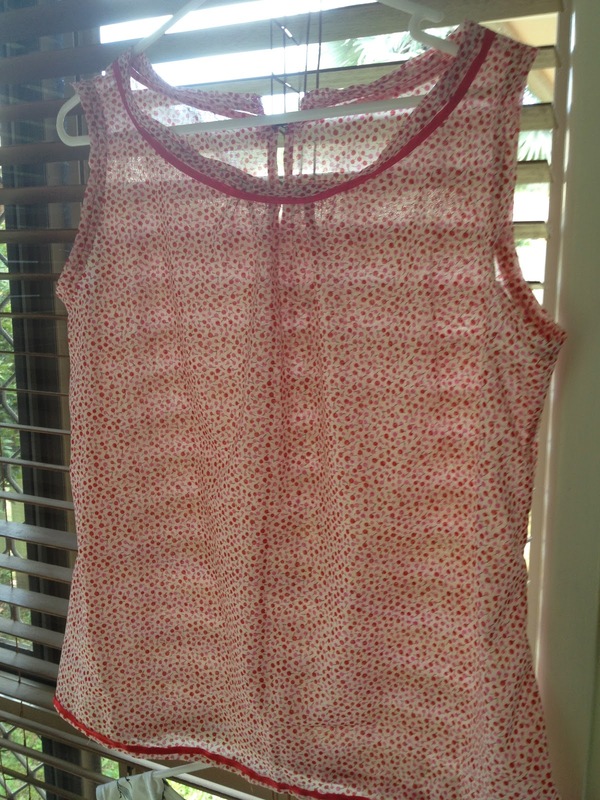 In an attempt to make lemonade out of lemons I finished this white top to take to Rockhampton tomorrow and added some daisy chain trim to the hem. (The lemons are Rockhampton. 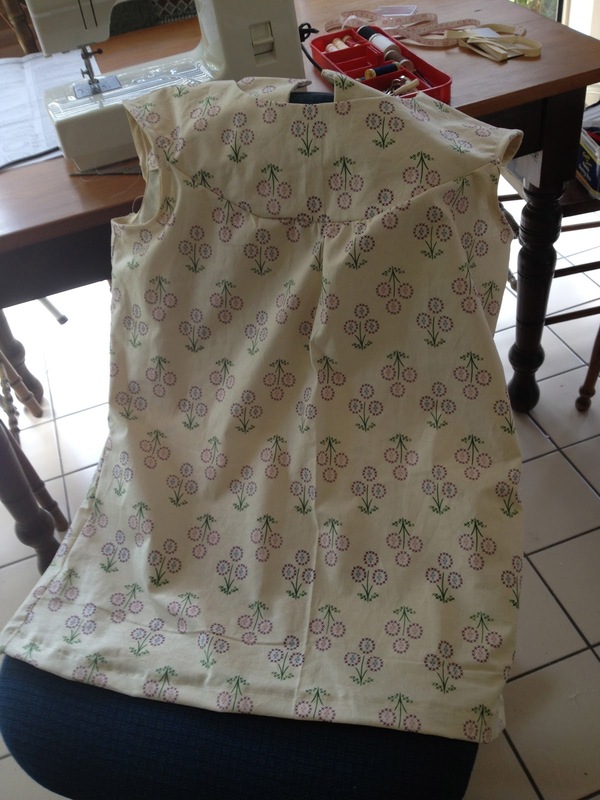 The lemonade is the daisy chain trimmed top that I will wear while there). I also whipped up a skirt to wear tomorrow and added red rick rack to its hem. I am trimming all over the place. This is for everyone enduring the stinking summer heat in Australia. I have spent the afternoon removing my "office" from the living area and setting it up in it's very own room. That's right. I have a room of my own. Well I actually have an entire house but you know what I mean. 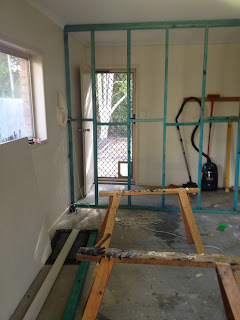 The office is no longer part of the lounge, kitchen, dining, sewing area of the house. My office consists of a seventy year old tray mobile procured from an elderly relative's estate, a student desk made of pine that I have owned since I was a student and a two drawer filing cabinet. I dream of a tidy, bespoke set up with a place for everything and everything in its place but at this point that's just not going to happen. I am really happy that there is air-conditioning now for summer is on its way. I do need bookshelves but that's a job for another day. What did I fill the space vacated by the desks with? This small sideboard and my very small collection of brass things. It looks nice. Different but nice. If you don't think this is an awesome song that references Christmas then I can't help you. I know it's featured in previous Spiralling Shape Christmas Countdowns but it's my blog and I'll post what I like. Enjoy. The build is nearly complete. 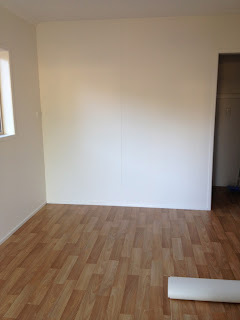 There is just the air conditioner to install later this week and then the room is ready to have things moved into it. I am very excited. It is light and airy. I can't wait to start using my silky oak wardrobe again after a number of years of neglect. The flooring arrived this morning. 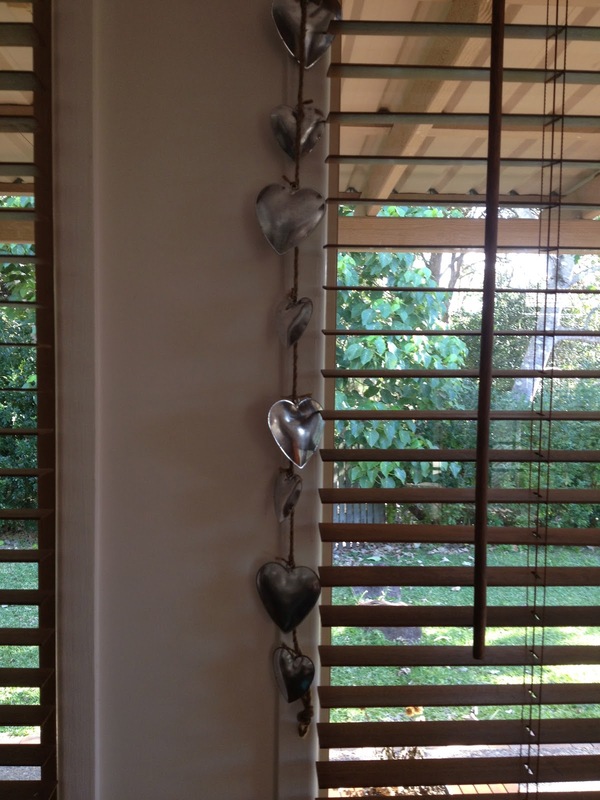 Oh, and I also have some blinds to put up on the front door. I've been eyeing this pattern on the various online fabric sites I've recently discovered. It was a little bit pricey in one store but on all the others it was sold out so I finally relented and bought it. 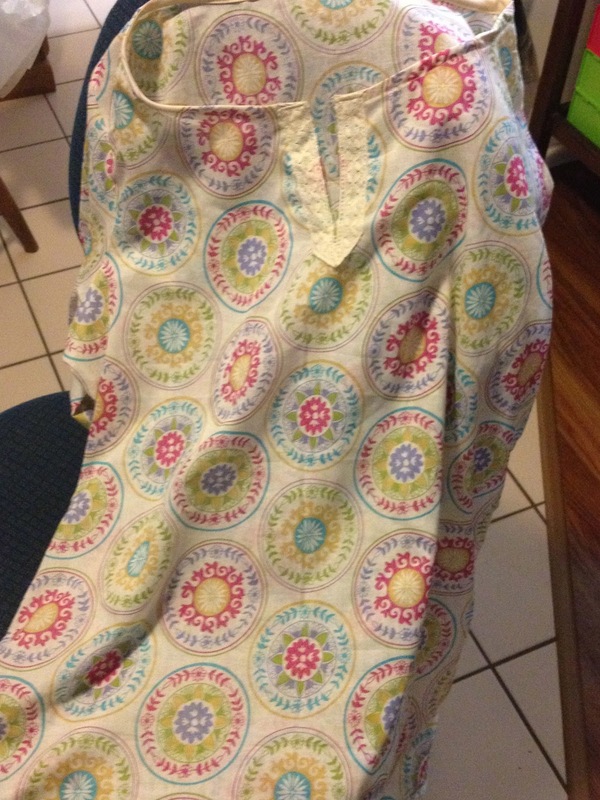 It was more complicated than it looked because the instructions expect you to also sew a muslin lining into the top. In a Queensland summer I just don't think that is going to happen. So I ignored all those instructions which meant I somehow got to the end and the armholes were supposed to finished but weren't. So I improvised with the old faithful bias binding solution and it worked pretty well. It's possible to cut it as a top, long tunic or dress. I went for basic length, decided I didn't need the belt or the flower. Here is the result. I had found this patchwork material for 6 dollars a metre in spotlight during the week so I wasn't too worried that this is the "test" version. 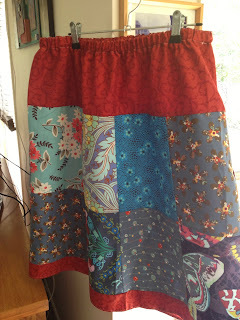 I wasn't planning on sewing this skirt this afternoon. I was just going to cut out the pieces and then cut out some other bits and pieces and sew tomorrow. This is the pattern. It doesn't have any pattern pieces. You have to do some measuring and some maths and then cut the material yourself. 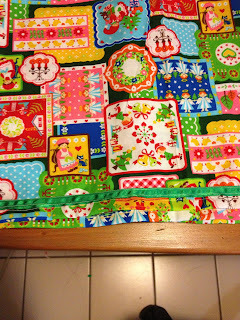 It says to use a rotary cutter and mat but I don't have any of that patchwork paraphernalia so I just pinned, used the scissors and hoped my eyes were seeing relatively straight. It's a four tier skirt that you can make look like the pattern with four different patterns. (It's a sideways photo...I think you can all cope). Or you can do what I did and just use one fabric. 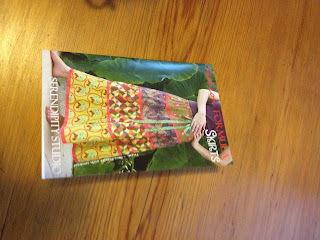 I got this in the post this week from Kelani fabrics. 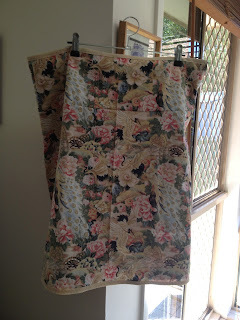 It's beautiful material and I had 2.5 metres which was the perfect amount for this skirt pattern. Unplanned! So in three hours I had cut the four tiers, gathered, pinned and sewed them altogether and prepared the waistband casing. It says there is a choice of drawstring or elastic. I am going with elastic which means I can't finish it until tomorrow because I need a wider, stronger elastic to take the weight of the skirt. It reaches to my ankles. So here's a picture of a nearly finished skirt - just elastic and hem to polish off in the morning! 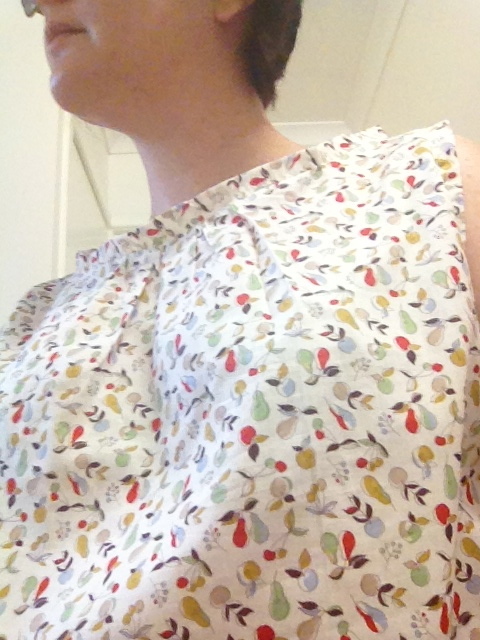 There was the option of the short or long placket at the neck. 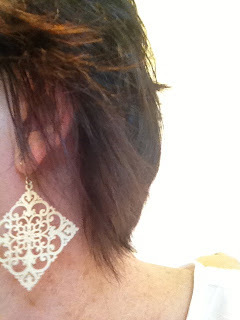 I went for the short and then decided to embellish with some leftover lace. Looks a bit of alright. 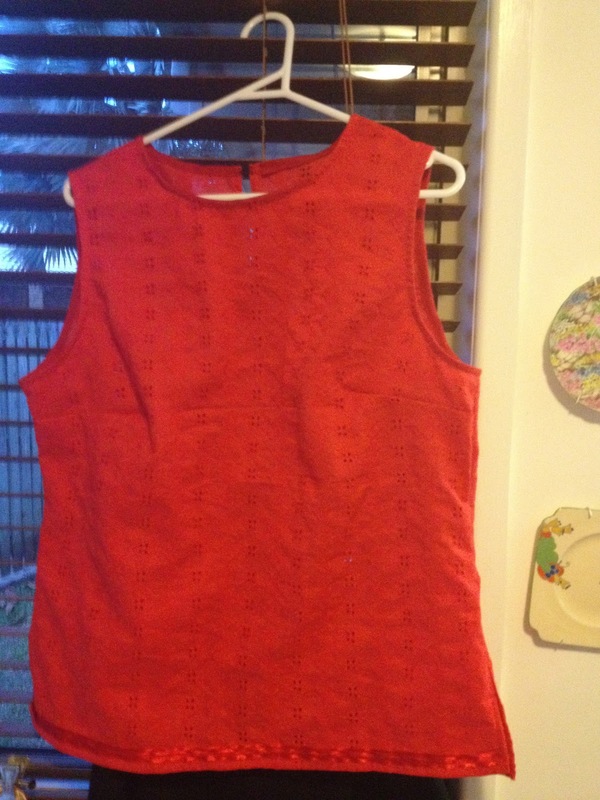 The pattern is for long sleeves which are then supposed to have a tab to hold them up but I decided given it was summer I would cut the sleeves off this time to just below the elbow. It worked out really well. I couldn't believe how straightforward it was. I have a new and disturbing addiction. It's called How I Met Your Mother. I feel dreadful about it. I'm not sure how it began. Probably I was flicking through the channels one evening after work. Tired of watching Friends repeats for the millionth time, perhaps I was looking for something new and different. Of course there was nothing new and different so I watched How I Met Your Mother instead. It's basically Friends but with only five cast members. See how different it is!! Not really. It's sort of the same way that Friends is Seinfeld but with sentimentality and 2 extra cast members. So now I record all the episodes that 7Mate chooses to air every evening and watch them in a desperate attempt to catch up to the current series which has just aired. Don't get me wrong. I think there is lots to like about the show. Neil Patrick Harris is a delight as Barney. He can act and strikes a perfect tone for the sitcom. The storyline that has him falling in love with Robyn is an odd choice and doesn't sit that well with me but sitcoms can't get everything right. Remember the "muffin top" episode of Seinfeld? Jason Segel is good as well, as is the actress from Buffy the Vampire Slayer (whose name escapes me and I am too lazy to Google it right now). I'm not so sure about the guy playing Ted. Will he ever get another acting job again? Wikipedia tells me he writes and directs films that are award-worthy. Perhaps that will be his thing. And the other one - Robyn - apparently someone wanted her to play Wonder Woman (source: Wikipedia). Naturally it has its flaws. The writers are often trying to be too clever for their own good with euphemisms and catchphrases that as far as I'm aware have not caught on. Or maybe there's an entire How I Met Your Mother community out there that's throwing them about in everyday conversation in the same way that I use "taking credit for someone else's big salad" or "these pretzels are making me thirsty" or "I don't wanna be a pirate". The use of flashbacks and forwards can be fun but sometimes over-used. In the end though, there are worse ways to spend half an hour and plenty of really bad sitcoms out there by comparison. It's not quite Grand Designs. The budget and scale of the project are minute. I'm not turning an abandoned chicken shed into a three storey, eco-friendly family home made of straw bales. 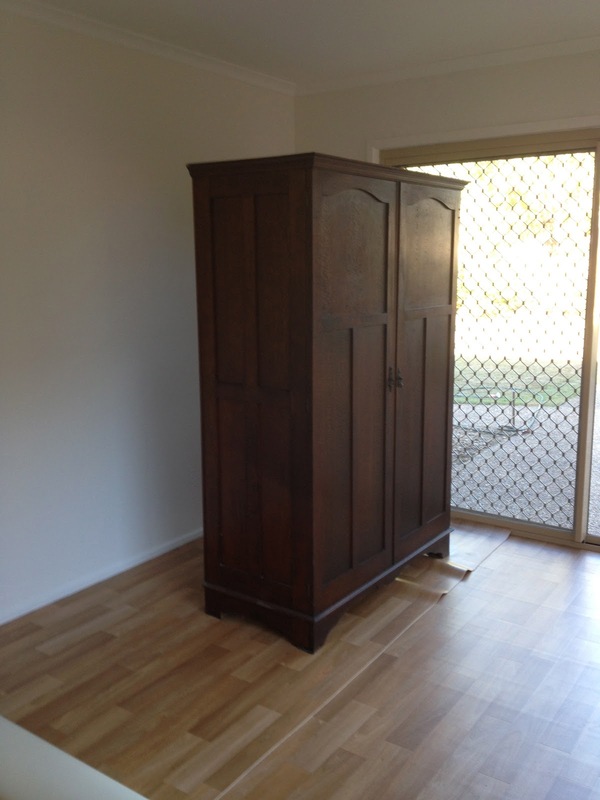 I'm just turning my unused garage which usually stands empty except for a few cleaning bits and pieces, an old silky oak wardrobe and the cat food into a room. That's right - a whole new room in which I will put the piano, a decent sized table for sewing, teaching theory and other bits and pieces and perhaps a couch of some kind. There will hopefully be enough in the budget for an air conditioner. There will be floor covering and new paint. I may have a feature wall. 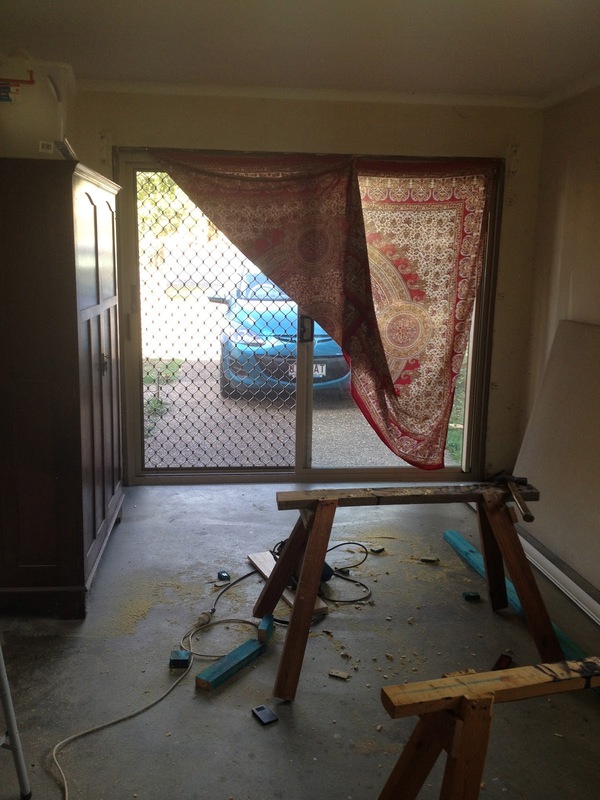 Last week the first step in "the build" occurred when the cruddy roller door was replaced by a shiny new sliding door with a security screen. 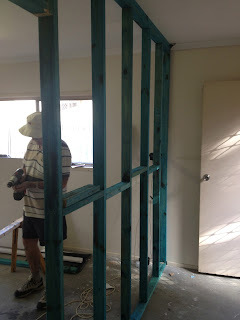 Yesterday, my project manager (my father) started on the inside. The plan is an internal wall that cuts the garage in two unequal sizes - one that will give me access to the back door, with enough spaces to keep all the brooms, vacuum cleaner, cat food, litter box etc and then the big room which will be the proper room. Here's how it was looking by the afternoon. Looking towards the back. See the wall frame. It should have the sheeting on it by today. Sheeting? Is that what it's called? I don't really know. All in all it's very exciting. It means that there will be more than one room in my tiny house to do things in! My mum bought me this excellent green saucepan in return for me looking after their garden while they went on holidays. I used it today for the first time. What gourmet delicacy did I cook up in it Nigella-style I hear you ask? Mushrooms. Not just any mushrooms. Mushrooms for the very important meal of lunch which yesterday in my sewing addiction I neglected to eat and then felt light-headed and icky by the afternoon. So this saucepan had an important task today. It provided my lunch. Well done saucepan. Apart from green saucepans I've been sewing whenever I can in between work and piano teaching and other things. 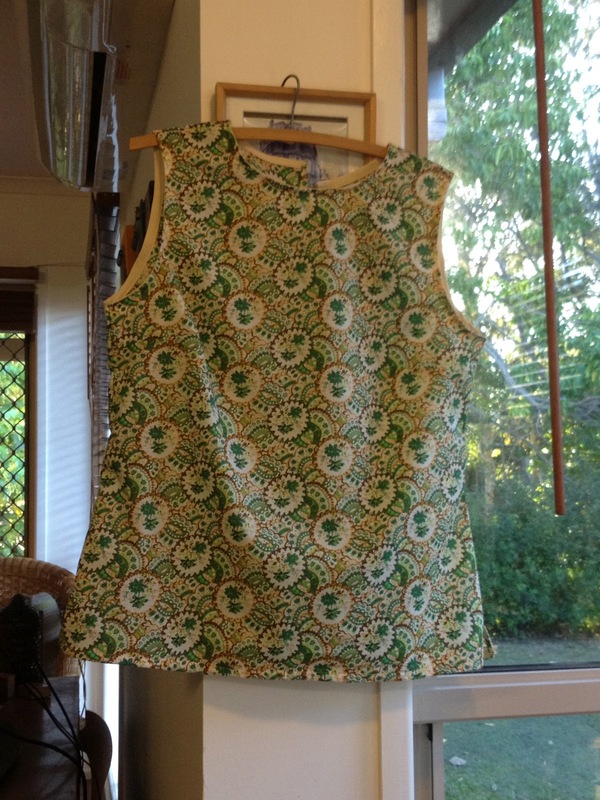 I finished this dress on Friday afternoon. It was my first go of the pattern. I know what to improve next time. I don't know that it will be a "wearing out to special occasions" dress but it will make an excellent "wearing on stinking hot summer weekends" dress. Then yesterday I tried a new top pattern. The giant faff-up on the neckline which involved an hour of tiny unpicking and resewing may have contributed further to my headache. Still I was pleased with how it turned out. I got all decorative on its "arse" (so to speak) and added the red border of ribbon at the neckline and around the hem. I will definitely make this pattern again I think. And then I went to spotlight and bought MOAR MATERIAL. 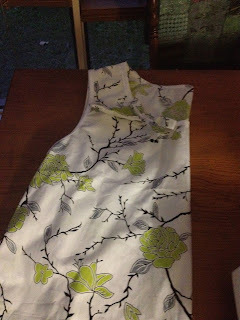 I was hoping to get my green apple dress made this weekend so I could wear it to work on Melbourne cup day but that will depend on the headache situation later today. I cut this skirt out last weekend and sewed it together yesterday and today. It's another attempt at the A-line pattern. This time though I had the advantage of owning a zipper foot for putting in the zip. It did take me ten minutes to work out how to change the foot on the machine but then the ease of sewing in the zip made it all worthwhile. I'm sure I'll get quicker. See how close I can get to the zip below. 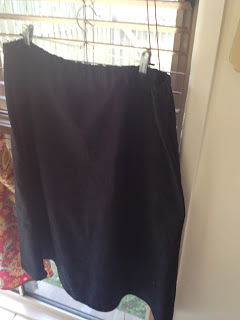 Last weekend I made a matching black top and skirt that I had planned to wear to play in a concert tomorrow. It turned out really nicely but unfortunately the skirt was an appropriate playing the piano length but less appropriate for sitting and playing the violin. 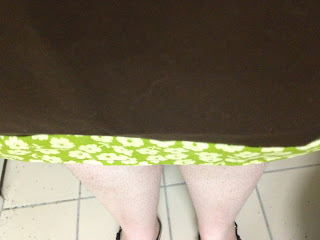 So I whipped up my basic 1 hour pattern yesterday in another black skirt that I will probably wear again and again. And then during the week I discovered that I was supposed to wear a coloured top tomorrow so I took the opportunity to venture back to Spotlight, VIP card in hand and buy MORE broderie anglaise this time in red. (I already have black and cream waiting to be turned into items). The red turned out pretty well and in a moment of either genius or stupidity I decorated the hem with some red satin ribbon that I had impulse bought a week or so ago. I'm going with genius. It occurred to me today that I seem to have discovered a new hobby. It's the kind I could bore people silly with in conversation if I chose to. Instead I'll just post photos all over the place. After days of hay fever I finally managed to get to the doctor and get a prescription for my heavy duty nasal spray. Almost instant relief. Of course the doctor's visit was for something else. Two weeks ago I tripped up the stairs at work and gave myself a monster bruise on my shin. It turned a beautiful shade of purple almost immediately and grew a big lump. I dutifully treated it with ice and congratulated myself on being 1. brave 2. first aid literate (thank you Girl Guide training). It was sore to touch but I figured it was a big bruise so it would take some time to disappear. Last Thursday I was teaching at Innes Park and afterwards looked down at my foot which was significantly swollen and there was bruising where there had been no bruising before. Resisting the urge to panic (just) and pacified by my good friend ringing her husband who is a cardiologist to check if I should be worried (worry if both feet are swollen - heart or kidney problems) I went home but decided to go to the doctor the next day. Just to be on the safe side. I also scared myself a little bit stupid by googling "bruised shin swollen foot". You'd be surprised how many results pop up. "Hmmm" she said. And then swiftly booked me in for the last ultrasound of the day at the medical imaging place. I do not have fond memories of ultrasounds given that the last one picked up the monstrous ovarian cyst. I was slightly disconcerted on arrival at the ultrasound place when the nice lady at the desk told me "Because we're looking for a DVT that's an emergency so you'll go in straight away". Long story short, I was very brave, the gooey stuff was warm, the ultrasound lady was nice and finished up by telling me to "have a good weekend". I figured if there had been something wrong she would have picked up the bat phone and whisked me into emergency. The report clarified my amateur diagnosis. All's well that ends well. I slept well on Friday night for sure. Another weekend and more sewing. This weekend I cut out the A line skirt pattern I bought over the inter webs. 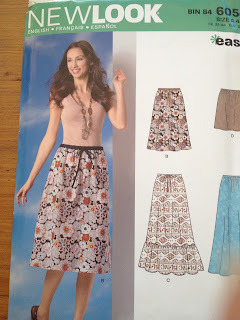 Either I did something really wrong or the pattern was wrong because the waist pieces did not match the skirt pieces. I did some creative "adding of material" to the waist pieces so they matched. Phew. Then came the kicker....time to sew a zip for the first time since I was about 20. Yes I had a zipper foot for the sewing machine but I had no idea how to use it. I figured I would manage with the normal foot. And I did. 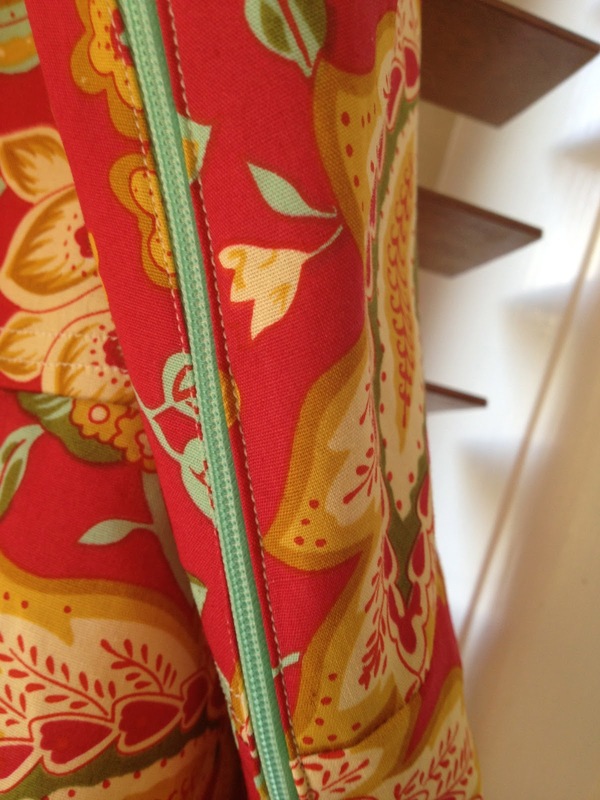 It may not be the most beautiful zip in the world but it goes up and down and the skirt fits and stays on. It's made of some patchwork material that has been sitting in the cupboard for many years. 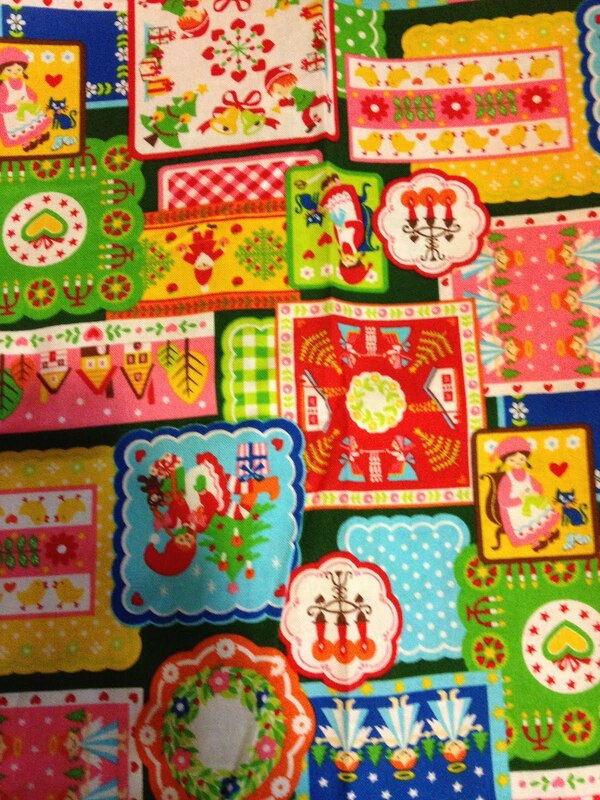 Like I'm going to do any patchwork! Pfffft. What's that you see? Yes indeed it's rick-rack. Rick rack is a running joke in our family. 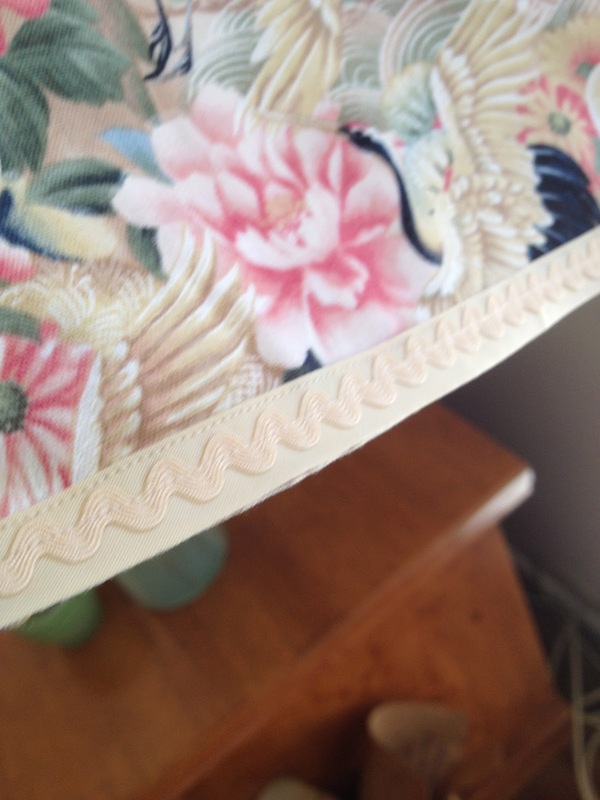 As a child my mother sewed lots of my clothes and invariably they were decorated with some kind of rick rack. 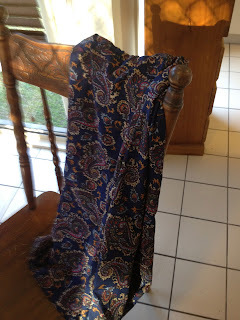 I couldn't resist buying some a few weeks ago and I figured since I had mucked up the waistband on the skirt by sewing the bias binding to the wrong side and then having to turn it into a "feature" that I may as well do the same for the hem and then rick rack away. Perhaps I got a little carried away. Whatever. I sit in my office all day. I'll wear what I like. 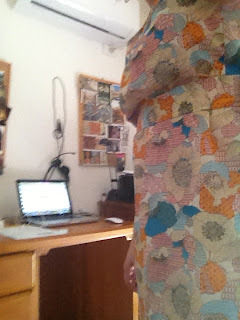 Buoyed by my (ahem) success with the new A-line skirt pattern I decided to try a new dress pattern. This one came from spotlight this morning where I finally caved and became a VIP member after the zillionth time of them asking me. I was going to do the "no sleeves" version but then I thought, "Hey, I can sew a zip! How hard can sleeves be?". Well the answer dear friends is quite hard especially if you cut the material probably a size too big and then have to sew in the side seams meaning that the arm holes don't match the sleeve pieces any more. It's more difficult when you only realise this at the point of sewing the sleeves into the arm holes after you have hemmed them etc. At first I ended up with weird puffy sleeves where I had to gather the excess sleeve material to make it fit the arm hold. Then I decided that I was not Anne of Green Gables so I sewed the excess down, sort of like a reverse dart. I'm calling it a topstitch kind of feature. Luckily the busy pattern means you can't really see it. Anyway, although it looks like a tent on the hanger it fits pretty well after all my adjusting and I might even wear it to work tomorrow. And that is the end of my sewing adventures for the weekend. The sewing frenzy continues. I spent every day at work wishing I was at home sewing. That is strange isn't it? Yesterday I made two things. This top and this skirt. I am very happy with the top. It is better than last week's effort with the same pattern where I didn't take enough notice and got the bird pattern upside down on the back. 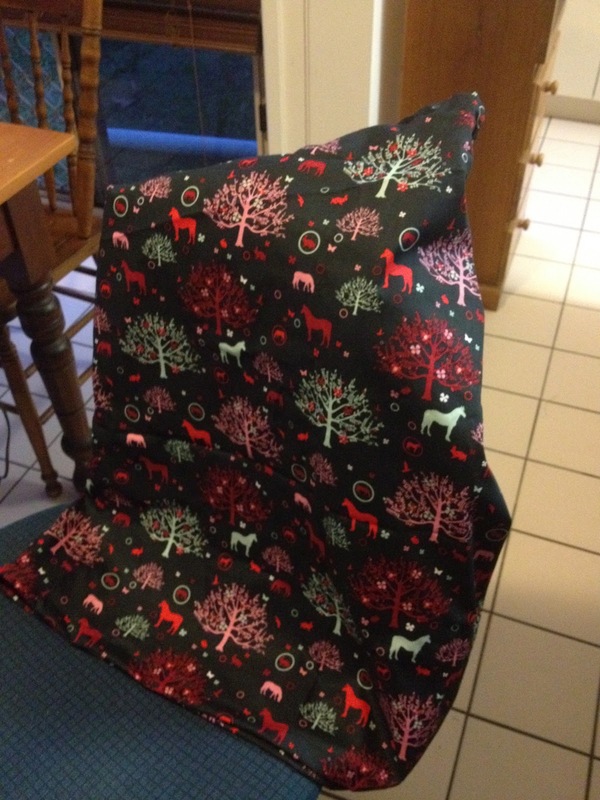 And I managed to cut the skirt material so that the little horses were the right way up on the front and the back. It's the simple things that are the achievements! 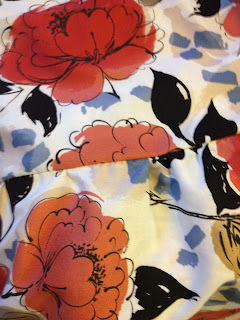 My seams were also much neater yesterday than last week. I was more confident at cutting and snipping and adjusting slightly to fit me. I am the "pear shape" so most shop clothes - especially dresses - rarely fit me properly. 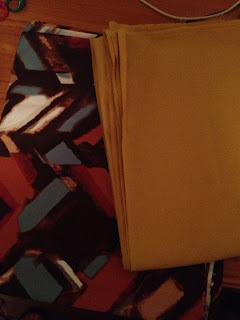 I am going to attempt a simple shift dress today and I have material for one more top. 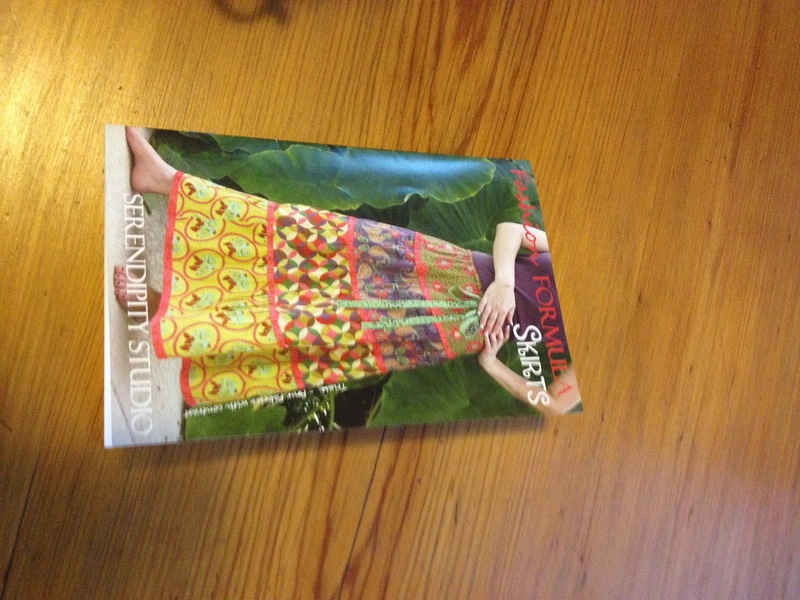 I also bought a pattern for an A line skirt with a zip in the side. 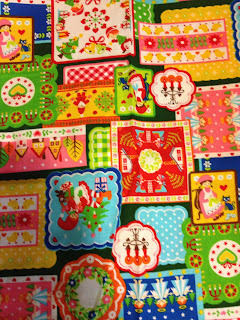 I am saving some lovely material that has been in the patchwork cupboard for many years for that. I have to trace the pattern off for my size with that one. That might be my challenge for next weekend. It's lovely to have a project going. I am using it as an incentive. 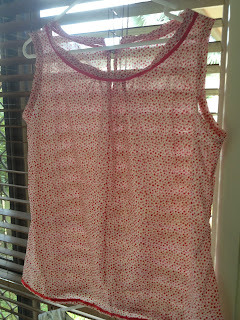 If I do all my yucky house jobs then I am allowed to sew. Yucky house jobs include washing, folding, tidying, cooking, very light cleaning, remembering that it's bin day, putting all my shoes away neatly. You get the picture. I am hoping the same incentive scheme works for my last assignment for the term which is due at the end of the month. Study first....then sewing. What did you do this year on your birthday? I'm betting you didn't wake up and think: "I know! It's been almost 20 years since I sewed anything. I think I'll make myself a skirt!". That's pretty much how my day went and it was delightful. I am not good at long term craft or sewing projects. Over the years I have tried knitting, long stitch, tapestry, latch-hook, cross-stitch and other such lady-like accomplishments. In Year 8 I made some macrame owls that my mother insists on keeping in her laundry. They are truly garish. But when I was first at uni I did used to come home in the holidays and sew clothes. Dresses mainly, because I can never get dresses to fit me in shops. Lately I've been looking for skirts for summer and just found nothing. This might be because I live in the regions and our shopping is limited. It might also be because there aren't many skirts around. I don't know. About 5 years I bought my own basic sewing machine. At the time I was keen to try patchwork. The fiddliness of that totally tried my patience and the machine has sat in the cupboard ever since gathering dust. A few years ago I covered it with a tea-towel but that was all the attention it received. Until today. Elastic waist, no zip, various lengths. The lady on the packet looks happy so how hard could making the skirt possibly be? Then after much deliberating I decided on a dark patterned material (in case I made a dreadful hash of it), bought some thread and took it all home. I got the sewing machine out of the hall cupboard, gave it a dust, switched it on and hoped for the best. I was fine with the cutting out of the pattern and the material. I decided not to worry about the fancy-schmancy bow, because bows and I don't really get along. I read all the sizing and decided to cut the biggest pattern and just do bigger seams if needed. And hey, whaddya know... I have a skirt. I only ran into trouble once - when the bobbin ran out of thread and I couldn't remember how to fill it. But (and here's my sewing tip of the day) if you Google filling bobbin Janome MS 2008 some lovely instructions appear through the magic of the internet. 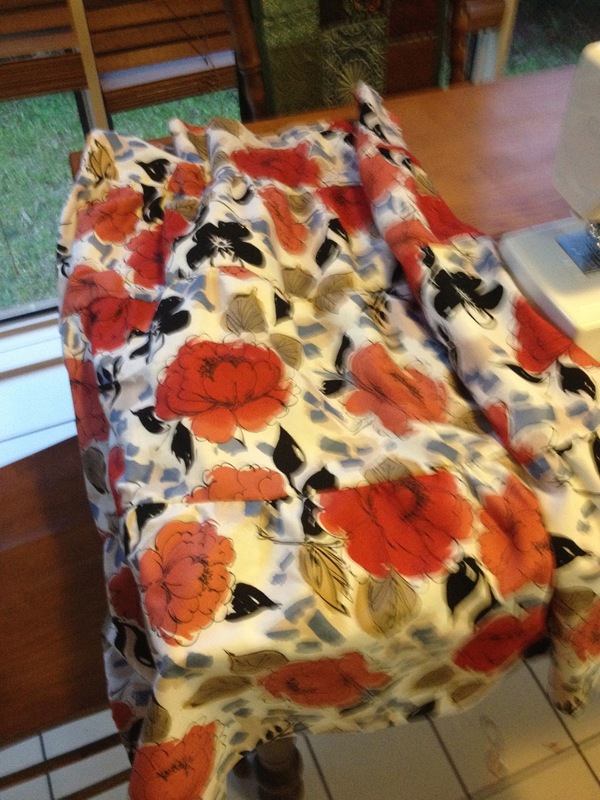 My mum helped me with setting the waistband casing to thread the elastic through but I did all the sewing myself. I cheated on the hem and zig-zagged it on the machine because I hate hand-stitching and this was just an experiment. Two and half hours later....ta da I had a skirt. And it's not just any skirt. It's the 39th Birthday Skirt. I'm going back to Spotlight tomorrow to buy some slightly heavier material as I think it will hang better. I'm also going to get this for Christmas. First Tuesday Book Club - Jennifer Byrne is a bit too smiley for me to cope with on a Tuesday evening. Sorry. The News - any channel - it's all too depressing. Randling - I have tried. I have watched the episodes with Anthony Morgan because he's funny, but the actual show is a bit of a slow, tired fail - crochet merch excepted. There's lot of good talented people who I am usually a fan of but watching people think out loud isn't actually that interesting. Q and A - despite the fact that I'm usually out on a Monday night there is no way that I will watch this contrived version of some kind of Jerry Springer yuckness. (You can take that comment as a comment too by the way). Putting people on a panel who don't agree with each other in the hope that they will disagree in public isn't really trying very hard is it? That's quite a long list isn't it? Clearly, I'm quite harsh and judgemental. Here's what I have been watching. Call the Midwife - wonderful British drama based on a true story. I loved the first two episodes so much I downloaded the book and have finished it. Miranda Hart is fabulous as the clumsy, posh midwife who can't ride a bicycle. Doctor Who - no justification required. For all your Doctor Who needs go to Circulating Library. Rockwiz - the best music quiz show on Australian television ever. Julia Zemiro is outstanding, the Rockwiz orchestra is fantastic, Brian Nankervis is a genius and the guests and audience panel people are fabulous. Highlights of this season which finished last night? Mary Wilson from the Supremes and the cover of The Weight last night. Smash - yes it started promisingly enough but has turned into a soapy-opera about putting together a new musical in New York about Marilyn Monroe. Still I am persisting because I love watching rehearsals - real and fictional. Gardening Australia - yes, they had a bad time after Peter Cundall left but with Costa and his giant beard in charge of things this is lovely viewing. Repeats of Friends - I know. It's hopeless really but anything is better than the news. I cried on Tuesday afternoon when I arrived home from work. All because of the size of an envelope. I shall explain. When you enter students into music exams in the AMEB they do their exam and then you have to wait for about a week and half for the AMEB to process the results in Brisbane, put their certificates together and send them back to you in the post with the comments sheet. On Monday afternoon I arrived home from work to see the great big A4 envelope stuffed into my letterbox. This was it. The results. I had 10 students sit exams and one of them sat for her AMus.A diploma which unlike all the other exams is basically a Pass/Fail exam. It is a recognised Diploma examination and requires a very high level of technical ability and musicality. So when I saw the big white envelope my heart started to race as I got out of the car. I didn't even wait to get inside. I stood on the footpath, ripped it open and madly flicked through all the reports looking for the AMus. report. It wasn't there. What a let down. It must still be on its way. Maybe they do something special and magic with that one I told myself. Maybe she didn't pass. Who knows what the hell happened. WHY WASN'T IT THERE? Anyway, all my other students passed so I dutifully went inside and read their reports and then phoned their parents. They were all happy. Another restless night. I went to work on Tuesday and tried to forget about the postman until I got home. I drove in the driveway and immediately noticed that there was no big white envelope. Phew. I was off the hook for another day. I didn't have to open anything with trepidation and worry. But, wait a minute. What's this? A small, ordinary sized envelope from the AMEB sitting in my letterbox. What the hell was this? Where is the big A4 envelope with the certificate inside. That's it then. She failed. I was a failure. The previous year of endless lessons, discussions about Bach, Mozart, Chopin, the history of the piano, etc etc etc, the extra lessons, the worrying about musical maturity, the questions about whether I had chosen a suitable program of pieces washed over me. I walked towards the front door feeling sad and opened the envelope. I looked at the section where the examiners wrote the result. It said "AWARD". Sorry? I looked again. "AWARD". Not "NO AWARD". She passed. I burst into tears in my lounge room and stood there for a good five minutes sobbing. No wussy little tears running down my face. This was full on crying the like of which I have not experienced for many a year. I rang my mother and was unable to speak. "What does the report say?" she asked me. "I don't know...I can't see to read it". It's a wonder she understood what I said. Why was the envelope so small? Because they don't send out the certificate for the AMus.A. You get invited to a graduation ceremony to receive it. How was I to know that? I haven't had a student sit for an AMus. exam before. The opportunities for this in a regional area are few and far between. Usually by the time students get to this level they are ready to leave town and go to university. It might not happen again for many years. 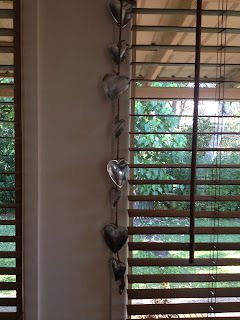 It seems like Sunday is blog day here at The Spiralling Shape. Except for last Sunday when I spent the morning with my little piano chickens at their exams. There were tears, laughs and mild panic....and that was just me. Needless to say I was happy when the weekend was over. I took two days of leave from work to catch up on everything that I hadn't done on the weekend. These things were two assignments, one workshop preparation and the basics of domestic goddessery which had been ignored for far too long. I got so much done from home rather than being at work. It was peaceful. I could concentrate and focus for the first time in a long time. I could make cups of tea when I wanted to. Lovely. A few more days and I might have even gone into my much neglected garden or cooked a cake or something. We shall never know. The rest of the week was a blur of assignments, panicked students at work and entering data into multiple spreadsheets. You know, the fun stuff. I was very much looking forward to Saturday and it didn't disappoint. My mum and I had a coffee in town. Then we went to meditation for the first time in weeks which was lovely although I nearly fell asleep. Then I came home and did fall asleep for three hours on the lounge. Delightful. This was followed by fish and chips for dinner at the beach with the parents and sister. We also had a store-bought ginger cake roll which was quite yummy. Then I came home and did all my washing in between watching the Paralympics and listening to the TunnFM RequestFest. The wonderful Mr Tunn played two of my favourite songs and I followed the other request action on Twitter. Surprisingly the domestic goddess activity is continuing today. I have been and bought food, remembered to put the bin out for the morning, and now I am cooking meals to restock the freezer. There will be lamb and chick pea curry and some kind of random vegetable stew situation that I just make up the recipe as I go along. It usually turns out okay. I know I'm not actually following the Nigella Lawson guidelines of domestic goddessery but you take what you can get. I shall spend the afternoon marking a couple of assignments, doing up a marking guide and catching up on my weekly library study activity. Then, and only then, will I watch the new Doctor Who on iView. Sadly, I have no tales of incident-packed personal grooming for you today. I managed to shave my legs again yesterday without any leftover salad hijinks. It's been a week of busy busy busy. In between all of this I have been trying to find at least 20 minutes a day to play my violin. 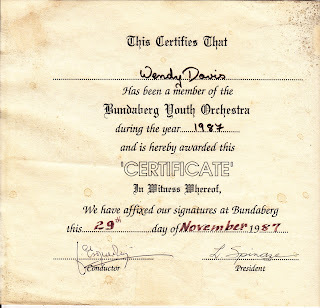 Next weekend the Bundaberg Youth Orchestra is having a 40th anniversary concert and past members are going to join in and play in the concert. 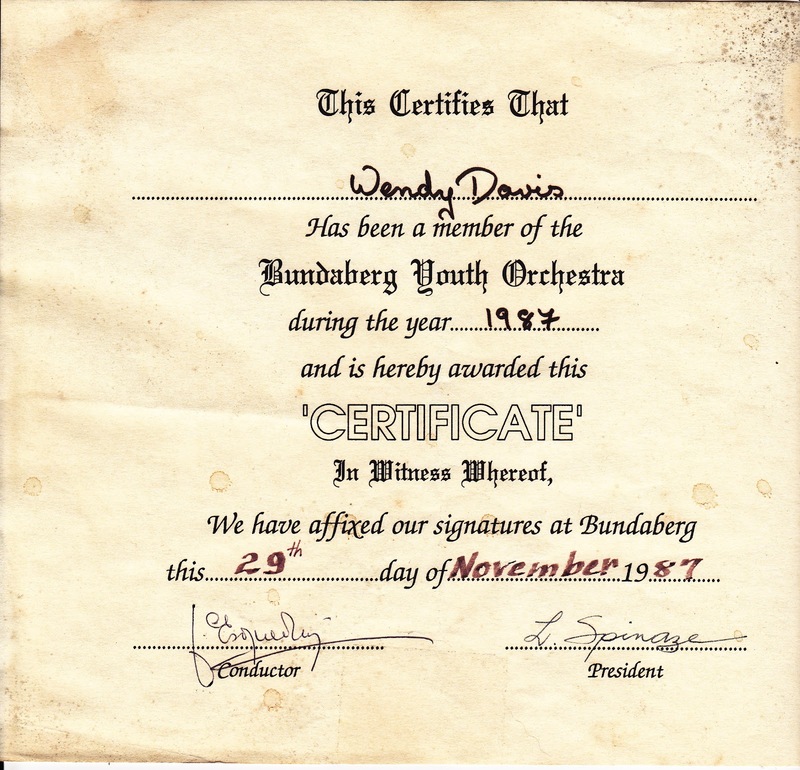 Here is evidence that I was once in the orchestra. This means a three hour rehearsal on Saturday afternoon and then the concert on Saturday night. Given that I barely play my violin for more than 15 minutes at a time, sometimes with months in between, I thought I should do some playing beforehand so I don't look like a total fail. The program is Beethoven's Egmont Overture, Death of Ase, Night on Bare Mountain and Finlandia. During the week I realised it had been nearly ten years since I had put new strings on my violin. Probably dumb to change them so close to a concert but I did it anyway. They are settling pretty well after a day. The TV has been rubbish lately. While the Olympics coverage from Channel Nine was pretty darn hopeless I did enjoying that I could turn on the telly and have something to watch. I am looking forward to the Paralympics now. I have returned to my DVD cupboard over the last week or so. I finished watching Lark Rise to Candleford, rewatched all three series of the IT Crowd, revisited Standing in the Shadows of Motown ( I never tire of that) and watched Gigantic (the TMBG doco) again. Last night I recorded the 25 years of Rage early 1990s so will do some reminiscing when I get to that. The only thing on the actual television I watched was I Will Survive a second rate, yet mesmerising reality TV, singing competition based on Priscilla Queen of the Desert. From this I learned that both Jason Donovan and Stephan Elliot must be pretty hard up for a gig. I also learned that I had no idea who the host was because I refuse to watch Packed to the Rafters on the grounds the saccharine promos make me ill so why would I watch an actual episode? Oh..of course I watched Rockwiz. That goes without saying because it is the best thing on the teev at the moment. Mary Wilson from the Supremes last week was truly inspirational. When I grow up I want to be Julie Zemiro. And in my spare time I worry about the Kath and Kim movie. I love Kath and Kim. Before it moved the Channel Seven it was wonderful telly. I wrote a PhD chapter about it. I still use "noice, different and un-ewe-usal" in daily conversation. But I think it was of its time. And that time is gone. So I worry that the movie is going to be bad-cringeful rather than good-cringeful. I shaved my legs this week for the first time since around the beginning of June. That's right. You heard me. JUNE. It's been too cold to bother with them. I've been wearing winter clothes so no-one could see the increasing hairiness and be shocked into speechlessness. I was not frightening any horses. That was until I happened to be visiting my parents and the topic strayed to the fact my sister had just bought a new lady shaver kind of thing that she thought was fabulous. "Oh" I said nonchalantly, pulling up the leg of my jeans, "I should probably shave my legs sometime soon". My parents both gasped in horror at my lack of ladylikeness. As the young, cool people say, they were full of disappoint in me. Later that week my Mum rang to see if I wanted to come up and eat dinner with them. I was teaching late so I declined but she tried to entice me with the promise of a present. "What is it", I demanded, wondering if it was worth my while after all. "A lady shaver". Hmmmmm. I decided to go up and see them the next evening. We ate dinner and then like an excited child my Dad raced off to get the new shaving device. "I'll put it together for you". (This entailed getting it out of the ridiculous packaging and putting in the two triple A batteries). I pushed my plate away and decided to try out my gift. Note: (and this will be very important in a moment) I had not finished up my salad. There was a slice of cucumber and some lettuce still on my plate. Once again I pushed up the leg of my jeans and attacked a path of my yeti-like leg. It was only a minute until I needed to clean out the hair. So I got the little brush that came with the shaver and scraped the hair out. What to do with this. I didn't want to put it on my mother's clean floor, so I deposited it on my plate on top of a slice of cucumber. I returned to my leg when suddenly all was disturbance and mayhem and my father was hacking and spitting into his hand. Oh yes, gentle readers, as is his habit of polishing off everyone's leftover food, he had decided to help himself to my slice of cucumber which was now garnished with some leg hair shavings. Laugh? My mother and sister and I were nearly sick with laughter. Now I realise nobody emerges from this tale looking particularly classy or genteel. Shaving legs at the table? Eating cucumber covered in leg hair shavings? Finding that uproariously amusing? It's not exactly champagne comedy. But these are the things that life is made of. The incident has been added to the time my father got really cranky because the TV remote wasn't working until someone pointed out to him that he was using his mobile phone as well as the time he was watching (*sleeping*) Billy Elliot and half an hour from the end asked "Does this boy dance?". The list goes on but he asked me not to tell anyone about the cucumber/leg hair surprise. So I have just written a post about it instead. I'm thinking it would be wonderful to have a Sunday where I mooched around the house in my pyjamas and do not much at all. Perhaps I would read a work of fiction or watch a film. Perhaps I would do some cooking or go outside into my much neglected garden. Perhaps I would have a little nap in the afternoon. I might even do some vacant staring out the window. It's been some time since I've had a Sunday like that. Instead I'm going to quickly shower, put on my university-issued corporate polo shirt* and black pants (no denim as per the staff briefing document circulated last week) and front up to the campus open day looking helpful and welcoming. I will answer questions and fill out forms for an hour and half before leaving to drive into town and accompany a cello student for her exam. I shall play Haydn, Elgar and Piazolla. I may or may not still be wearing my aforementioned corporate polo shirt. Then it's off to buy some groceries, get a prescription filled, return home to organise the week ahead, complete my coursework for the week, feel guilty that I haven't yet started my assignment due at the end of the month, unpack the printer I bought yesterday and in a feat of technological genius manage to get it talking to two computers. I fear the last task will take the longest. And that, my friends will be the end of Sunday. *there's also a corporate issue cap. I choose not to wear that. I woke up absurdly early this morning with what is known in our family as a bit of a "woozy" head. I hadn't been drinking. I'm blaming a combination of the tiredness from the week, female hormones and staying up way too late. Anyhow, it was a less than auspicious start to the day especially since I had an eyebrow wax appointment at 8:30. I rang and cancelled and then went back to sleep. When I woke up again I was fine although still tired. I made myself get up, eat breakfast, shower and go to meditation. I was supposed to go over to Saskia's (a lovely gift/homeware/coffee shop) with a friend and I really didn't feel like it. But I made myself do this too. Just as well, because we had a lovely chat, the best chai latte I have found in the Bundaberg region, and some yummy homemade pork and veal sausage rolls. Then I did some retail therapy. 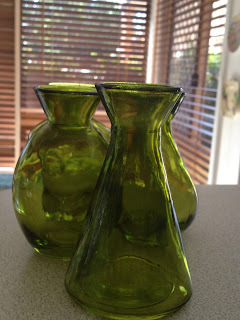 My favourite things are the green glass bottles. Really though, it was the chatting that did the trick!